Retirement income distribution is one of the most widely researched topics in Financial Planning. Financial advisors and financial planners are tasked with the responsibility of creating predictable and sustainable retirement income. Whether you live in Thousand Oaks, Calabasas, Simi Valley, Moorpark, or California; retirement income planning decisions are one of the most important factors contributing to your financial planning sustainability. In this article, we will examine some of the problems relating to constant averaging of investment returns in financial planning and how the sequence of investment returns are incredibly important when planning for retirement income distributions. Implementing a financial planning strategy assuming fixed withdrawals and constant average annualized rates of returns are problematic. For example, let’s assume a 65-year-old retiree begins taking withdrawals from her $684,848 investment portfolio. Simple math tells us that if she takes retirement income of $2,853.53 a month ($34,242.40 a year) and is earning a constant annualized return of 8% (adjusted for 3% inflation annually), her retirement income will likely last beyond 25 years in this scenario. But, what happens if she doesn’t earn a constant annualized return of 8%? The chart below shows portfolios (A and B) both earning the same average rate of return, but with very different sequences of investment returns. You’ll notice that both portfolios A and B experienced an average annualized return of 8% during both the accumulation and distribution phases. Portfolio A had consecutive market losses early on while portfolio B had consecutive market losses at the end of the 25 year period. 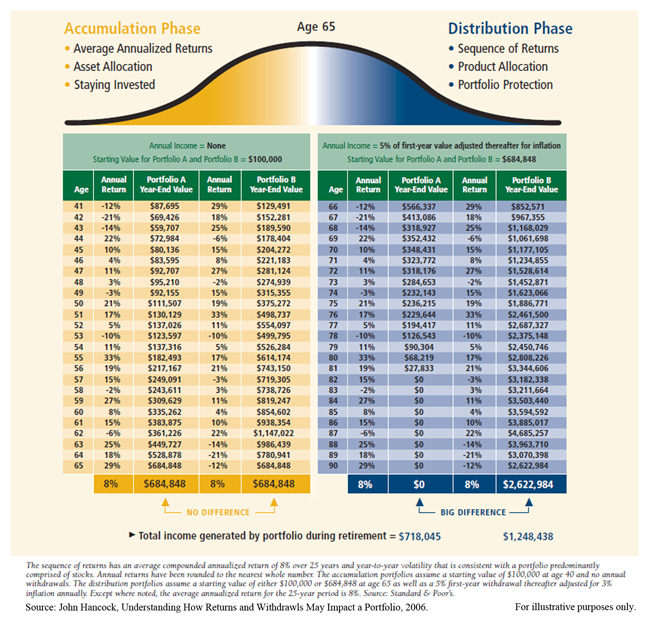 As it turns out, during the accumulation phase either of the sequences of investment returns had no effect on the portfolio in the accumulation period from age 41 to age 65. However, look at what happens to portfolio A during the distribution phase when the investment portfolio has consecutive market losses early on in retirement? When entering the retirement income distribution phase at age 66, the sequence of investment returns plays a much larger role. The impact of when rates of returns are up or down can make a huge difference. This chart illustrates how experiencing an early market downturn early on in retirement may result in running out of money sooner than anticipated. Being caught in this dangerous sequence of investment returns cycle could result in portfolio A running out of money as early as age 82, assuming the investor doesn’t reduce her withdrawal amounts or considers postponing retirement altogether. So, what can we learn from this? Simply put, the first 2 to 3 years of investment portfolio returns while taking retirement income distributions can make or break your long-term success. My research and experience suggests that starting out retirement in a bear market vs. a bull market could shorten your retirement income longevity by 13 to 14 years. This is why it is absolutely critical that you preserve your investment portfolio early on in the first 2 to 3 years of beginning retirement income distributions. At Geisbauer Wealth Management, we can help you manage for these contingencies and work to provide stability in your retirement income planning. Should you wish to learn more about this important topic, please don’t hesitate to contact me directly at (805) 558-8497 or at tim@geisbauerwealth.com. This article was posted in Blog and tagged financial planning, retirement income. Bookmark the permalink. Follow comments with the RSS feed for this post.Comments are closed, but you can leave a trackback: Trackback URL.